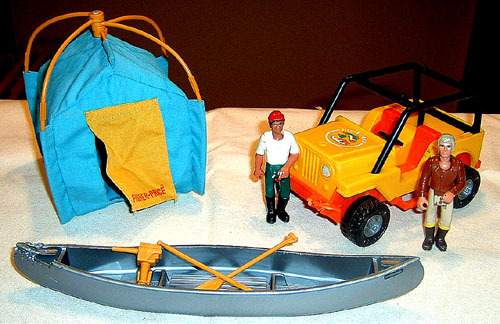 Description: The Adventure Series people are headed for the woods with their jeep and canoe camping set. Will it turn into a great adventure or a terrible disaster....you decide! FPT1174 - Orange Jeep with yellow seats, bumper, and sideboard. It has a black roll bar on top with a white elastic strap to hold the canoe on. The top of the hood has an emblem, it is a white circle with a Mallard duck and a fish inside. The top part of the circle is actually the words "FISHER-PRICE". *See "Variations" below. FPT1175 - Grey open-top canoe. FPT1176 - 2 each - Gold (Orangish/tan) plastic paddle (single-oar paddle) with a T-shaped handle. FPT1177 - Gold (Orangish/tan) plastic clip-on outboard boat motor with propeller (mounts to side of the FPT1175 canoe). FPT1178 - Blue cloth tent with a yellow cloth flap door. The tent is held up via seperate tan plastic collapsible frame. FPT1179 - Orangish-tan U-shaped plastic tent frame that has 3 pieces that attach together via a metal rivet. FPT1180 - Brad the Explorer - Man with grey hair wearing a brown long-sleeve shirt, tan pants, black boots, and yellow socks. FPT1181 - Hawk the explorer - Man with black hair wearing a red cap, a white short-sleeve shirt, green pants, black boots, and tan socks. *See "Variations" below. FPT3677 - Hawk has also been seen with black socks opposed to tan. FPT1182 - Yellow Jeep with orange seats, bumper, and sideboard. It has a black roll bar on top with a white elastic strap to hold the canoe on. The top of the hood has an emblem, it is a white circle with a Mallard duck and a fish inside. The top part of the circle is actually the words "FISHER-PRICE".